Share your files directly without uploading to a server.It is really an interesting method to share your files with your friends skipping the step uploading.Even you don't need a software to share files.you can share your files with your browser only.When you upload a big file to a server it takes sometime to upload depending on your internet speed.But in this process, we have included a method in which your computer works as a server.A receiver can access the file directly from your computer.Generally, we use two methods to share files either we upload that file to a free cloud storage or as an email attachment.But a downside of these methods are file size with email attachment if we want to share big file and may be files are not secure on cloud storage and it takes sometime to upload. 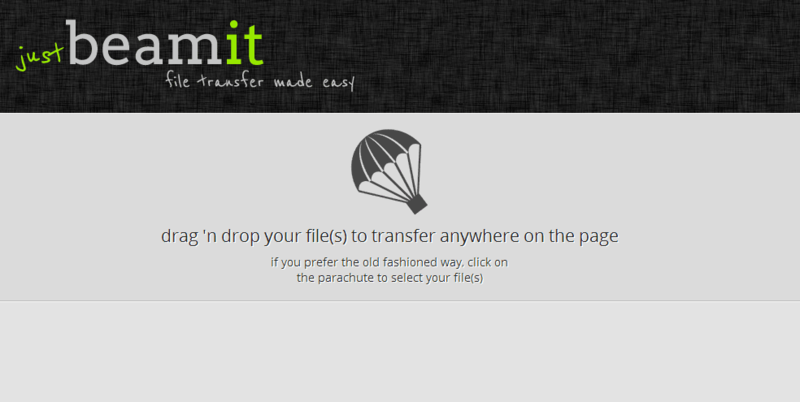 First, go to justbeamit.com then hit on Parachute to select your files or drag and drop your files on parachute symbol. This URL will be the download link for the receiver to download the file. Then select the file which you want to share.If you want to protect that file with password then add a password in the password field. You will get a unique URL.Copy that URL. Share that URL with the receiver to download the file.